Closing the Gap, a document released by the Assembly of First Nations at the beginning of the 2015 federal election, will continue to serve as incumbent national chief Perry Bellegarde's platform as he seeks a second term leading the national organization. The eight-page document outlined six general areas where work needed to be done by the next federal government in order to bring First Nations from 63rd on the United Nations Human Development Index to six, where the index ranks the rest of Canada. “There’s been a huge victory to closing the gap, but we say we can’t rest because (the commitments we have now) are still not enough to close the gap in an effective and efficient manner… We still have a lot of work to do,” said Bellegarde. Bellegarde takes credit for the closing the gap path for influencing all political parties to address Indigenous issues to varying degrees in their election platforms. While the New Democrats scored highest on the promised actions for Indigenous peoples, it was the Liberals that won the election. After the election, Prime Minister Justin Trudeau promised that a renewed relationship with Indigenous people was his government’s top priority. “Closing the gap is going to be ongoing,” said Bellegarde, pointing out that after decades of not having sufficient funding for programs and services, and successive governments not respecting and honouring treaty and inherent rights, it was never an expectation that the difference could be made up in one or two fiscal years. Since the Trudeau government has been in power, successive federal budgets have committed $17 billion over seven years to address such issues as on-reserve education, child welfare, boil water advisories and housing. There’s been commitments to end the two per cent cap on funding and work towards long-term, sustainable funding. The Liberals also rolled-out the Murdered and Missing Indigenous Women and Girls national inquiry, which has been embroiled in much controversy; is developing a law that will revitalize, reclaim and maintain First Nations languages; promised to pass a law implementing the United Nations Declaration on the Rights of Indigenous Peoples; has struck a Cabinet committee to review policies and laws related to Indigenous peoples; and has committed to implementing all 94 Calls to Action from the Truth and Reconciliation Commission. In Bellegarde’s second term his focus would be on the fiscal framework; ensuring self-determination for First Nations, allowing them to move beyond the Indian Act at their own pace; and ensuring that processes are put in place for First Nations to exert their own jurisdiction in such areas as child welfare. “Yes, there’s movement. Yes there’s some progress and we want to maintain that progress, maintain that momentum, have that consistency and continuity, which is why again I’m offering my name to be national chief again for a second term,” said Bellegarde. While Bellegarde takes credit for pushing the federal government, those seeking to unseat him – Katherine Whitecloud, Miles Richardson, Russ Diabo and Sheila North – aren’t convinced that Bellegarde wasn’t just in the right place at the right time dealing with a Liberal leader, who was already moving in that direction. Bellegarde’s opponents also say they’ve been approached by chiefs on the campaign trail concerned with what’s been seen as Bellegarde “cozying-up” to Trudeau. It’s a charge former national chief Shawn Atleo, who stepped down partway through his second term, also faced, but in his case it was with the Conservatives and Prime Minister Stephen Harper. The issue leading to Atleo’s downfall was a controversial First Nations Education bill proposed by the Conservatives and backed by Atleo, but opposed by many chiefs, including Bellegarde. Now that Bellegarde is facing similar criticism, he is adamant that his criticism never was of Atleo. “I don’t believe I’ve ever criticized a national chief for being too close to anything… I’ve always tried to function as a team player. We have to bring up different ideas, different strategies, but at the end of the day you have to work together,” he said. As for being too close to Trudeau, Bellegarde says Mohawk Council of Kanesatake Grand Chief Serge “Otsi” Simon has it right when he says every national chief is branded as being too close to the government of the day. “We have to have relationships with the policy and legislative decision-makers. 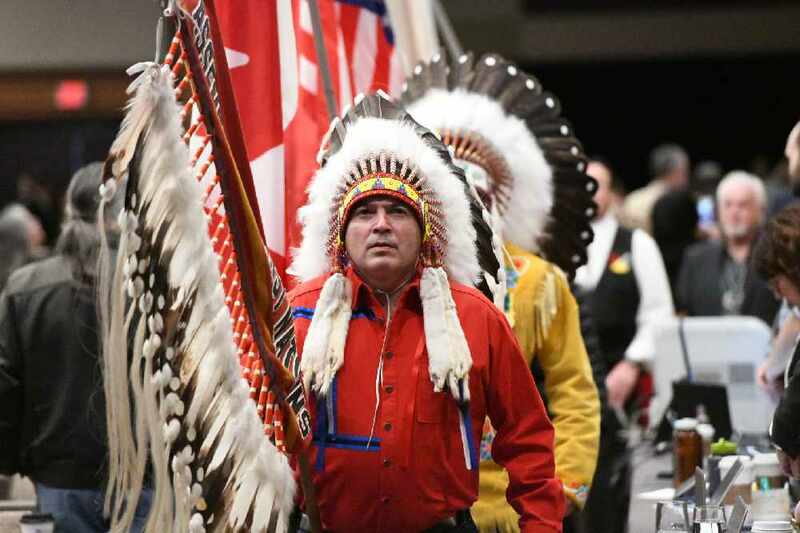 We have to have access to them in order to influence their mind, their thinking and what goes forward because we’re advocating for policy and legislative change to respect and … implement inherent rights, Aboriginal rights and title rights and treaty rights.” Bellegarde said he has a strong relationship with the leaders of all four main federal parties. Bellegarde is particularly proud that Trudeau has attended three chiefs’ assemblies, the first prime minister to ever do that. He also believes that the divisive AFN he inherited is now a unified organization with credibility and stability and is relevant for First Nations, responding to issues and concerns and providing chiefs with the opportunity to interact with Liberal Cabinet ministers. He contends that the AFN is a strong advocate organization. “The Assembly of First Nations is there to open doors and that the chiefs come through those doors to speak to their issues, concerns and priorities and I believe we’ve done that,” said Bellegarde, who claims he hasn’t taken the AFN beyond the advocacy role. But Bellegarde admits changes are needed with the organization, which is being governed by a charter more than 20 years old. He is promising changes in his second term and says they will be guided by input solicited from teams travelling across Canada and initiating dialogue. Bellegarde, a member of the Little Black Bear First Nation, was elected national chief in 2014.